Everest is one of the leading Building solutions provider company in India (as per company website). It builds products for roofing, ceiling, wall, flooring & cladding solutions and also manufactures Pre-Engineered Steel Buildings for industrial, commercial and residential applications. Residential, Commercial and Industrial roofing. It is major service line for the company. Fibre cement based products like Prefab, Ceiling, Flooring, Wall solutions. Design, manufacture and erection of pre designed steel buildings, Smart builings. Example Shiv Nadar school, Cochin shipyard building and HCL building. Panels, Pans and Boards created with fibre cement. So Company has ventured into most areas areas of building solutions. It started mainly as roofing solutions company but with time explored other verticals to be a complete one touch point company. It will be interesting to see how the company performed on stock exchanges during this journey. Has it made money for investors? 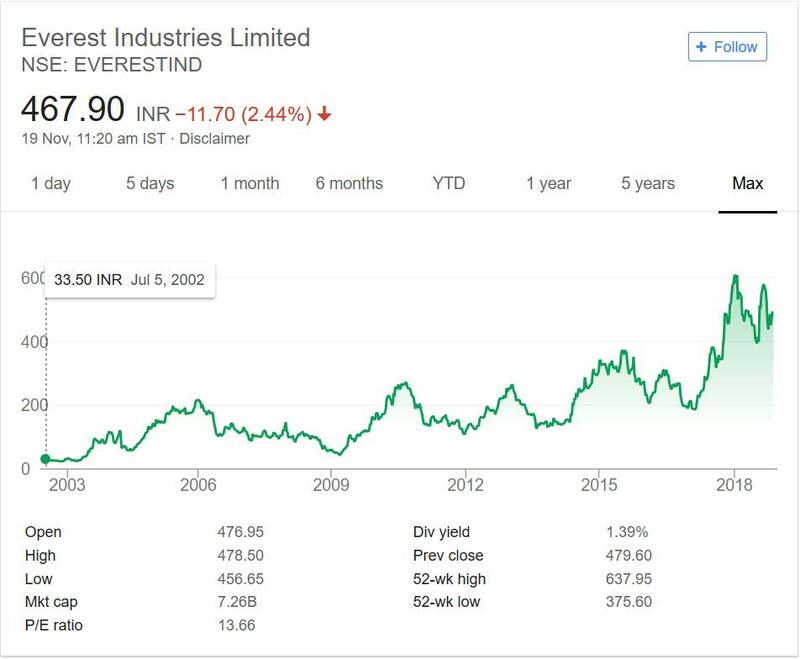 Below is Everest Industries stock performance for past 15 years or so. This will give insight into Company performance. We have long period to eliminate any periodic impact on price. Now lets see and try to understand Company performance with respect to stock price performance. The company was trading at 33 mark in year 2002. It performed decently for next 4 years but due to 2008 crisis prices came down. In year 2009 it was not trading too far from its 2002 levels after having touched 200 levels before. The company prices recovered after 2009 and crossed 200 mark twice before year 2014. It has an all time high of 600 above mark. The dividend paid by company it good at current price point. It is giving more than 1% dividend which is good. After looking at above chart one thing is very disappointing. The company always have up and down movement. It moves to some point then retreats back. This is hall mark of a cyclic business. It seems company has good quarters and then bad ones. There is no steady improvement year on year. This fact is reflected by up and down movement of the prices over the years. Every time it makes a high prices come down and then it makes the high again. Everest Industries is in portfolio of Vijay Kedia one of the top investors in India. The company operates in growth sector of Building materials. It operates in residential, commercial and industrial space. With Indian economy growing the demand for industrial and commercial space will increase. Residential space will also have positive growth. But in my opinion the company is targeting the industrial and business space more with recent product launches. The roof solutions will have popularity for Rural consumers and urban will be attracted towards the Fibre cement structures due to premium look and feel. The company has also started exporting the products so that will be big positive. The steel building concept will gain popularity with time as more and more institutions start using the concept after looking at existing building created by the Company. Everest Industries is one of the most experienced players in the niche it operates. That will certainly give it a major boost. So you can add it to your stock watch list and see the progress of the company. There are not too many building solution providers listed. Major ones are still a small company. Everest Industries is one of the bigger players having tested touch times and good times. You can explore newer players and see how they compare with the old player in terms of product mix and competition.